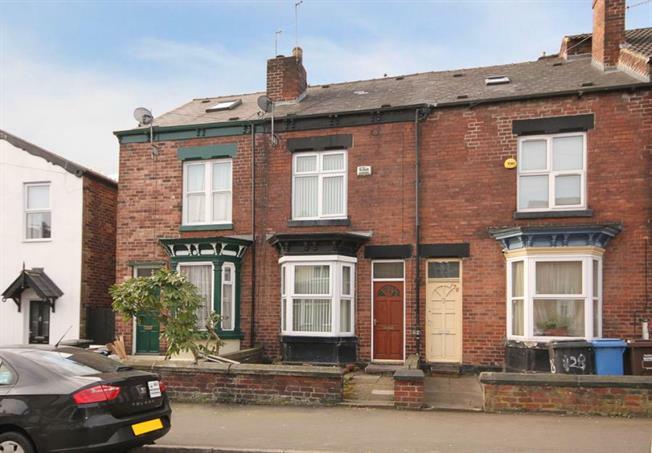 3 Bedroom Terraced House For Sale in Sheffield for Guide Price £180,000. FEATURED IN THE BIG OPEN HOUSE - Please contact Blundells Banner Cross branch to book in your viewing. An excellent opportunity to acquire a deceptively spacious 3 doubled bedroom bay fronted mid terrace property. Benefitting from accommodation over three floors as well as a rear double storey off shot with two reception rooms, double glazing and gas central heating and NO ONWARD CHAIN. Occupying an increasingly popular position close to a host of amenities on Abbeydale Road, the property will be of particular interest to the first time buyer or families alike! The property comprises: bay fronted lounge with fitted carpets leading through to stairs to the first floor landing, good sized dining room leading to an off shot kitchen which gives access to the rear garden. A cellar is also accessed from the dining room. The kitchen benefits from a range of base and wall units and space for a free standing cooker and plumbing/space for an automatic washing machine. To the first floor landing: front facing master bedroom with storage cupboard, extended bedroom to the rear, modern tiled bathroom fitted with a three piece suite in white comprising: wash hand basin, low flush wc and bath. Also benefits from a separate cloakroom off the first floor landing. To the second floor: stairs rising into a further double attic bedroom with storage to eves and velux style window. Externally: to the rear of the property is an enclosed low maintenance courtyard. Location: Well placed for access to a host of local shops and amenities along Abbeydale Road which include a variety of coffee shops and tearooms. Having excellent links to public transport as well as the City Centre and neighbouring suburbs.